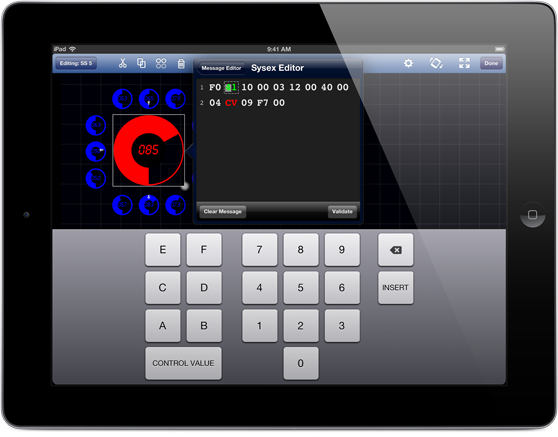 Transform your iPad® into the ultimate MIDI controller – control music apps, digital instruments, even MIDI controlled lighting, all wirelessly with Midi Touch. 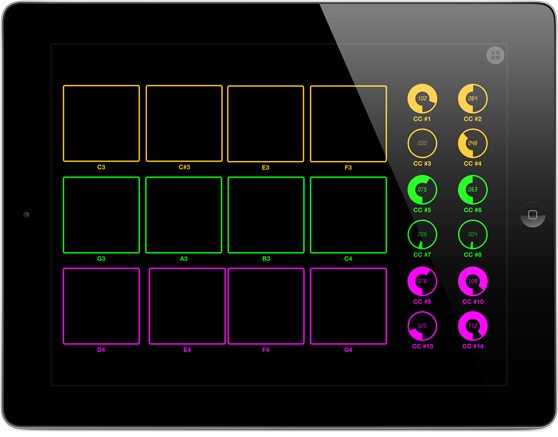 Midi Touch is the award winning app that has been used onstage & demonstrated at CES, NAMM, & Macworld / iWorld. Create and save your own custom Midi surface by placing knobs, sliders, X-Y-Z pads, drum pads, buttons and other controls on screen using the intuitive drag and drop interface. 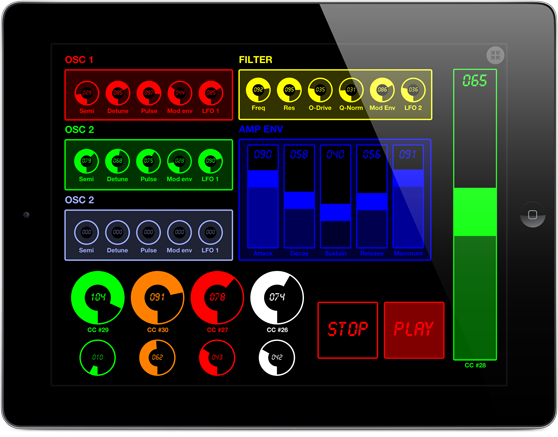 Design & save your own MIDI controllers by dragging and dropping sliders, buttons and more onscreen to create personalised control surfaces. Many different control types are available - Vertical sliders, horizontal sliders, knobs, buttons (momentary or latched), drum-pads, X-Y-Z controllers, transport controls and preset-jump buttons. 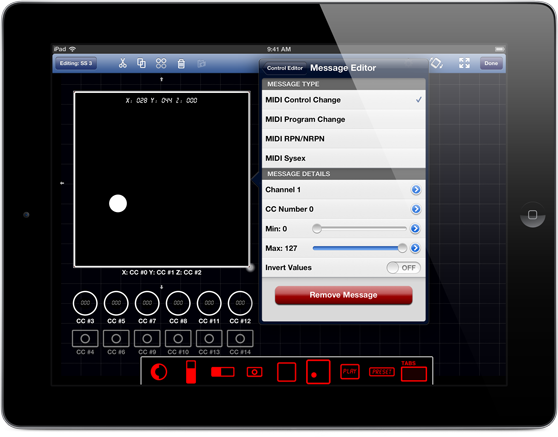 Native MIDI Device support - connect compatible devices via the Camera Connection Kit and your iPad® becomes a hardware connected MIDI control surface. With excellent responsiveness & performance - measured latency of 2-5ms over WiFi, 1ms via the Camera Connection Kit. Alternatively, send messages wirelessly using MIDI Network Sessions on OS X. Support for CC, Note, Program Change, SYSEX, NRPN & RPN messages. Assign multiple messages per control, all with feedback which keeps the controls synced to incoming messages. Customize the message on each control: CC number, note number, minimum & maximum range, channel, invert, size, and labels. Organise control groups with the tab container, and use colors to easily identify controls. Setup for performance: dim the screen and go full screen to control with intuitive gestures. Invert controls, double tap to reset, and fine tuning gestures. Built in SYSEX message editor allows entering custom SYSEX strings with the value of the control embedded into the message. RPN/NRPN message types also supported. 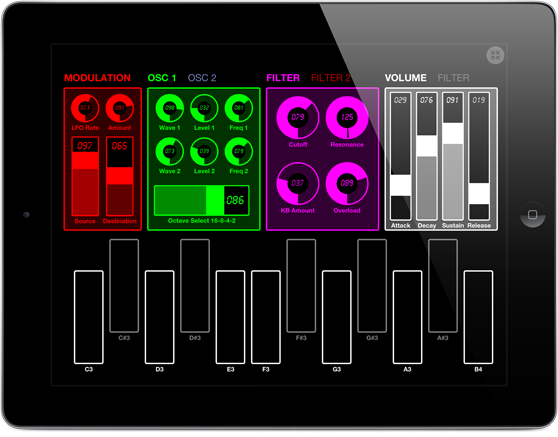 For general questions, support or bug reports please email iosmidi@domesticcat.com.au. For press packs, promotional review codes and more, please email press@domesticcat.com.au. Domestic Cat Software © 2013. All Rights Reserved. Apple, the Apple logo and iPad are trademarks of Apple Inc., registered in the U.S. and other countries. App Store is a service mark of Apple Inc.